The more astute amongst you will have realised that 'III' is the third effort from this Aussie rabble of bluesy riff mongrels known as Electric Mary, following on as it does from 2004's 'Four Hands Down' and 2008's excellent 'Down To The Bone'. I haven't heard the band's debut effort, however 'DTTB' was a grooving delight of machine-gun drums, bourbon soaked vocals and dirty, dirty, dirty riffs and I'm glad to say that 'III' continues in the same vein. Bandleader and vocalist Rusty Brown spits out aggressive, lived in vocals, but in a way that actually marks him out as a singer, rather than a shouter and when he is fronting the mighty riffs and catchy hooks which Electric Mary seem to produce at will, he really is a fine howler indeed. Bursting into life with the Clutch like riff of 'O.I.C.' Electric Mary immediately set their stall out with huge slab of guitars, with the fuzzed up attack being the perfect foil for the gang backing vocals and Rusty's enigmatic hollers. A bluesy swagger comes to light in the shape of 'Bone On Bone' and 'Waiting', while 'Long Time Coming' punches home with an urgency and viciousness that keeps you gripped from start to finish. Not afraid to step out of the expected, 'Lies' and 'American Jam' add a spacey quality to the vocals, offering a sharp contrast to the brutal guitar bursts, throbbing bass and powering drums, while 'So Cruel' dips a toe into Stoner territory. 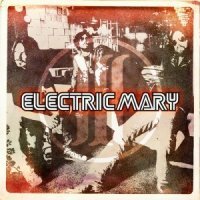 Already one of the more promising bands to have hit the scene in the last few years, 'III' keeps up Electric Mary's high standards and is an album that deserves to see them make the next step into the big boys' playground.